From the visionary force behind 'Night Watch'. Day Watch (2006), a Russian dark fantasy action movie is also known as Night Watch 2: The Chalk of Fate. 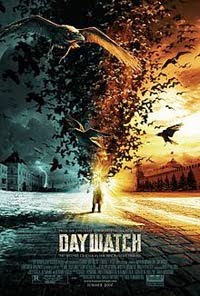 As the sequel to Night Watch (2004), Day Watch is based on the second and the third part of the novel Night Watch, the first book of Sergei Lukyanenko's internationally acclaimed trilogy rather than the second book, Day Watch. Both "Nochnoi Dozor" (Night Watch) and "Dnevnoi Dozor" (Day Watch) are novels about the everlasting fantasy battle Good and Evil, Light and Darkness. Synopsis: Anton Gorodetsky (Konstantin Khabensky) and his love interest Svetlana (Mariya Poroshina) are Light Others, working as Night Watch operatives in Moscow. Anton's son Yegor (Dmitriy Martynov) is a powerful young Dark Other who would become a Great One as mentioned in a prophecy. The balance between Light and Darkness is affected by the murder of some Dark Others and Anton finds himself framed and accused of the murders. Realizing that the chain of events starts off with a mistake he made a long ago, Anton seeks an ancient Chalk of Fate that has the power to change destiny. Having read the novels, I decided to watch the movies too. However, I only managed to watch Day Watch on DVD and I couldn't seem to find Night Watch online. Day Watch has a straightforward plot and continuous timeline from its prequel, Night Watch. Apart from the main plot about Anton trying to change destiny, there are quite a number of subplots involving other characters. So, if you haven't read the novels and if you haven't watched the first movie as well, you'll find yourself lost while trying to understand the characters and storyline that don't seem to make any sense most of the time. Let me highlight some of the main characters:1. Anton: The main character who wants to use the Chalk of Fate to change destiny, Light Other, Night Watch operative. 2. Svetlana: Anton's love interest and apprentice, Light Other, Night Watch operative. 3. Gesar/Boris: Head of the Night Watch operatives/Light Others. 4. Olga: Light Other, Night Watch operative. 5. Yegor: Anton's son who chooses Darkness. Note: In the novels, Yegor is not Anton's son. 6. Zabulon: Head of the Day Watch operatives/Dark Others. 7. Alisa: Zabulon's minion and love interest. 8. Kostya: A vampire whom Alisa falls in love with, Dark Other. The best parts of the movie come from its fast-paced and mind-boggling scenes, such as a car being driven vertically along a tall building and racing cars driven at impossible speed without causing disastrous accidents. Excellent special effects and well-composed soundtracks give added boost to the movie too. In summary, this movie is recommended for those who are into dark fantasy.